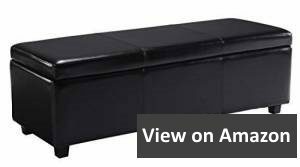 Best Storage benches make the perfect solution for the storage of children toys, pillows, blankets, shoes, magazines, books, hats, among others. An added advantage is how the benches can also be used as tables or footrests. Choosing the right one often proves almost impossible, therefore, the following review and buyer’s guide of some of the modern benches will help you decide. Seville Classics Foldable Bench offers style and versatility. It is a beautifully designed bench, which doubles as a coffee table or a footrest among many other tasks. Seville Classics Bench has all the particular qualities you are looking for as an addition to your home. It comes with a sturdy build, is lightweight and has an elegant charcoal ash grey finish, which is a perfect complement to most home decors. The storage compartment is hidden and can be accessed by removing the top coverage, which folds away quick and easy. Space is generous and enough to fit clothes, magazines, toys, shoes, among other small items, this is why the product is more popular in dorms, apartments, and most homes. The bench is one hundred percent Polyester. The charcoal grey fabric’s top cushion is button-tufted for stability and a stylish look. The fabric is non-woven and is fully synthetic to add more touch to the look and feel of the foldable bench. It supports a total of 500 pounds, making it sturdy enough for several people to sit on it. When you have lots of mess lying around the house and you are unsure where to start from in arranging them, the perfect solution is Simpli Home Avalon Bench. It is handcrafted, extra-long, and it features a durable faux leather with elegant exterior stitches. The bench packs an engineered solid pine wood frame with plywood extras to support the upholstery. The top lid is padded, has a child safety hinge to ensure that it doesn’t jam, and upon lifting, it reveals an ample functional storage ideal for concealing all the mess around your home. Simpli Home works as an incredible bench for several persons, as well as a regular table and a perfect storage center. It is available in a wide assortment of colors including tanners brown, slate grey, satin cream, fawn brown, blue, and midnight black. As a result, if you are looking to use it in your doorway, the guest room, bedroom, living room or wherever you choose, it will fit your design just perfectly. Depending on your taste, the neutral colors will bring more ambience better. The stylish build of Simpli Home Avalon bench makes it among the highest ranking benches on the market. Together with all its amazing features, it makes exactly the type of bench you want for a variety of uses. The Otto & Ben 30” Button design is a multi-purpose bench constructed with high-quality memory foam to guarantee comfortable sitting. 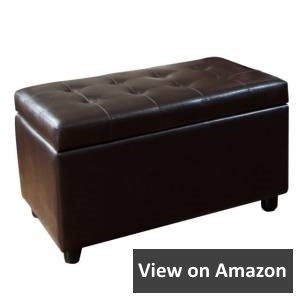 The surface has faux leather and is padded to make it have a luxurious feel and look like the other Ottoman products on the market. It combines a quick and intuitive assembly that can be achieved quickly as well as a strong build that provides stability. The strength is reinforced by medium density flipper board, which is strong enough to ensure that it supports up to 250 pounds. The bench is foldable with a lid design that is tufted. It lies flat and unfolds to reveal a storage space enough to store away all the mess in your room. Folded, the bench doubles as a footrest, a perfect sitting couch, or a beautiful small table. When not in use, the bench can be easily folded flat and stored effortlessly. The faux leather material is waterproof and easy to maintain. Cleaning the bench involves wiping dry, or spot cleaning using a cloth. It is a perfect choice for those seeking simple, yet convenient office benches, bedroom footrests, or those who just simply need a bench they can rest on away from the standard upholstery. It is also a perfect toolbox if your needs extend that far. Unlike other products classified as benches on the market, the ClosetMaid 3-Cube bench is more of a drawer with a cushion top than upholstery. It is highly multi-purpose with convenient and spacious storage space. Add that to the white color of the product, and your room is left looking as stylish as never before. The construction incorporates three cubbies that are designed to hold three drawers, which are not included, for the keeping of a variety of items in your home like shoes, clothes, blankets, hats as well as those accessories you need when you want to leave the house. This is one reason why the perfect and the easiest place to install is by the door. 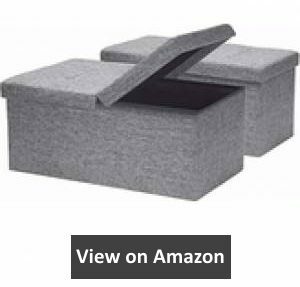 The top of the three cubies is a cushion soft enough to act as a seat. The fixture offers easy assembly and comes with all the necessary components required together with an installation guide. You can choose from up to three types of finishes and over 20 colors, depending on your taste. Each cube comes with a full back up for the storage of the items. To get the best out of the ClosetMaid 3-Cube Bench, using it with fabric drawers of your choice will offer maximum storage and concealment. Everything about the Sorbus Faux Leather Folding Ottoman Bench is amazing. The bench has an attractive build, which makes it a perfect choice for a functional, stable and an elegant accent piece that also works as a storage compartment. The bench is superbly crafted with high-end faux leather that is easy to clean and does not easily stain. It comes with a padding cushioned for comfort, precisely stitched and button-tufted for a luxurious feel and look. The meticulous build blends well with every other upholstery in your living room and makes the bench a substitution to your plastic storage baskets. It accommodates dorms, bedrooms, and small apartments. It is also perfect for the closets and children rooms. The storage space is for storing magazines, pillows, blankets, among other items. It also is a perfect fixture to sit on while relaxing or by resting your feet on them. 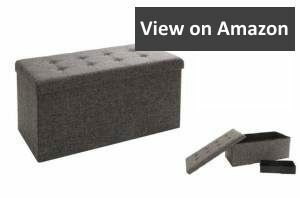 Anybody looking to create a cozy home with a variety of upholstery needs Sorbus Faux Leather Folding Ottoman Bench. It can also work as a subtle toolbox to conceal most of the items you want to put away. It is foldable, lightweight and is easy to put together without any complicated tools. The lid opens simply by being lifted. 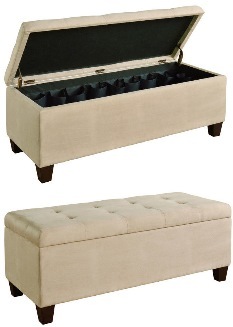 The Carmen Shoe Storage bench is ideal as a closet addition and can also be installed at the foot of the bed. The lid is adequately cushioned for comfort when using it as a footrest, or when you are sitting on it and watching the TV, or doing other things. It comes with a silent safety hinge to protect you, your children or any other person using the bench, from potential accidents, and to ensure its durability. The lid doesn’t detach from the rest of the furnishing. It is made from premium quality beige microfiber that effortlessly blends perfectly with your home décor design and the primary color of your home, adding a cozy and warm look in your guest room, living room, or in front of bed. The gorgeous look is further facilitated by the shape of the top of the bench, which is tufted to make it much more attractive. The lid opens to give way to a lavishly designed interior spacious enough for the storage of shoes. The inside has been installed with shoe holders to enhance and maximize compact shoe storage to save on more space. It requires some assembly and is also available in red if you are looking to enliven your space with a bold color. The bench also comes with a warranty period of six months. Designed for multipurpose use, the Otto & Ben Smart Lift Top, is a footrest, a toolbox, a bench, and everything else all rolled into one. It is padded for comfort with a high-quality foam and a cushioned top, which makes sitting on it such a pleasant experience. On top of these amazing features is another high-quality material, the tweed fabric that makes the bench look lush, snug and modern accent to the storage space. It easily folds flat for easy storage with the lid opening on either side, which means clearing the top to access the interior is unnecessary. It is constructed from medium-density fiber board for strength and stability. If you are a color person, the bench is available in brown, dark and light grey colors, for your taste. 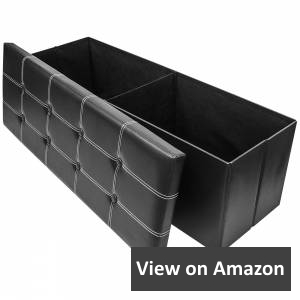 It is ideal for space saving in your home and can serve as a perfect entryway storage fixture for sitting on when removing your shoes and for storing them as well. Also, it acts as a toolbox and a box to store magazines, blankets, pillows among other personal items you don’t want lying around. The bench is for bedrooms, closets, play rooms, among other places in your home. Why worry about all that clutter lying around when you can use this bench to declutter? Set it up easily and put it wherever you want in your home. The interior partitions in the storage space are Velcro and can be detached easily. It has an elegant build with a dark brown finish that matches almost any home color design. The frames are crafted from wood and reinforced with plywood to support the upholstery; as a result, it is fairly durable. The bench is strong and long enough to support two persons. The upholstery is made from PU faux leather, making it easy to dry wipe while cleaning. The exterior is tufted, but has a smooth finish for comfort. It has a lid that pops up easily and is hinged to protect you from harm and ensure that maximum performance and long life is achieved. The interior is spacious enough to accommodate shoes, pillows, blankets, boxes and other items for concealment. 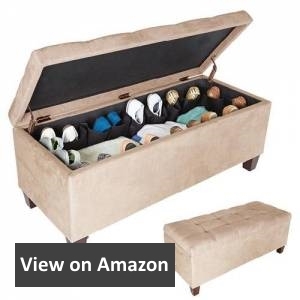 Aiding the storage is a flip under the lid for supporting rugs, linen, and other small items. Simpli Home Cosmopolitan Faux Leather is available in different colors including brown, black, blue, red and cream. It fits perfectly the living room, bedrooms, closets, guest rooms among other places and can be used as a bench, a footrest or a substitution to your plastic and wooden storage fixtures. As functional as storage benches are, many people are at a loss on what to look for while choosing them. The benches serve a variety of functions with the primary being a seat. One can sit on them while relaxing and watching the TV, reading, or even balancing while doing some exercises. Also, they serve as footrests when one needs a place to stretch their legs, or as a table. Apart from the bench use, these fixtures are used to store toys, shoes, pillows, magazines, books, clothes, blankets, tools, among other small items. Depending on what you want to store, the following are considerations to make when buying a storage bench. Where do You Want to Place? Where to put the fixture influences the type that you will buy. A bench storage for shoes and hat, for example, is put on the entryway or the door. A perfect bench for this purpose should be stable to withstand heavy use. On the other hand, a bedroom storage bench needs a proper cushion top as they are often placed at the foot of the bed for feet resting. Kitchen or patio storage benches should be strong and soft as they serve as tables or seats. The placement also affects the size of the bench storage to purchase. A closet storage bench, for instance, is not the same as the entryway or the living room benches, which tend to be longer and stronger. What is the Material of the Bench? Storage benches are available with various materials. There is wood, metal, wicker, plastic among other materials. Focusing on the build material is dependent also on the location of the bench. Wicker and plastic storage benches work outdoors and are designed to withstand unfavorable weather conditions like the rain. Finely finished wood benches require ambient settings like guest rooms, bedrooms, and the living room. Paying attention to the material determines how long the bench will last. Metal benches suit workshops while leather ones are the top for indoor use like living rooms and entryways. The ease of retrieval and the kind of items you are looking to store determine the type of storage bench you will buy. The most traditional types are the flip tops and the drawers. They are ideal for shoes, blankets, pillows, and the likes. Flip tops sometimes feature a single lid or double lids for ease of access. 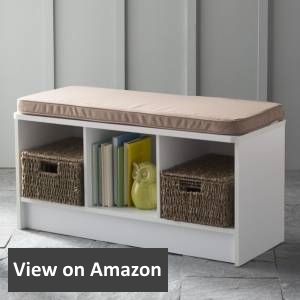 Cubby storage benches for books and other items that require frequent and easy access. There are also cabinet storage benches that feature accessibility through the front surface. These types also have doors to conceal things away. While considering the style of storage bench you are looking for, paying close attention to your home décor and personality is crucial. There are traditional wooden styles with carved features like arms, backs and lids with hinges, which are ever long lasting and have a timeless appeal. However, nowadays we have the contemporary, cottage, industrial and modern styles. While you may not need the industrial type in your home, the current models, like the above-reviewed storage benches, will transform your home and make it look luxurious. They incorporate a fusion of utility and high-end aesthetics to evoke a style that is the desire of many. The primary purpose of the storage bench you are looking for is another factor to consider before making a purchase. Many seek the storage benches for storing a variety of items ranging from books to blankets. Books require cubby types, personal items need storage benches with a closure system, perhaps, while shoe benches need supporting fixtures to hold them all neatly in place. Here, you can also consider the storage space you require, depending on the size or amount of items you are looking to keep concealed. If the storage bench will double up as a table, a footrest or a cushion to sit on, buying one with stable feet, durable leather and proper cushioning would be ideal. Discover a whole new world of storage benches. You don’t have to struggle on which one to choose and what to consider anymore. Whether you want a storage bench for your interior or outdoors, if you want a bedroom or a kitchen bench, wooden or leather material, the above buyer’s guide will guide you into choosing the right one that meets all your expectations. If unsure of what type, or what features a storage bench you want has, the reviewed products are satisfactory enough. Clearly, the versatility, strength and the lightweight nature of the Seville Foldable Classic make it the winner. It also has a great price!